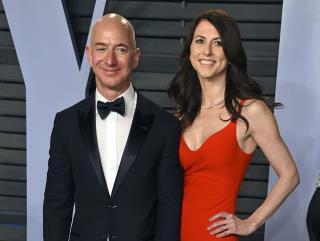 (Newser) – Jeff Bezos and his wife, MacKenzie, are ending their 25-year marriage, the Amazon CEO announced on Twitter Wednesday. "We want to make people aware of a development in our lives. As our family and close friends know, after a long period of loving exploration and trial separation, we have decided to divorce and continue our shared lives as friends," reads his tweeted statement. It touchingly continues, "We feel incredibly lucky to have found each other and deeply grateful for every one of the years we have been married to each other. If we had known we would separate after 25 years, we would do it all again. ... We remain a family, and we remain cherished friends." Read the statement in full here. I was going to make a snide comment about her manly figure. but then I saw she is 48. she looks good for 48. she's going to look even better with that big divorce settlement. I think marriage license should be just like fishing licenses, personally. They expire. no harm, no foul. No settlement if you choose not to renew. give them a 3 year shelf life and watch just how nice everyone is to their spouse in the re-up year. With 137 billion dollars, he could pay for Trump's wall and never miss it. He'd get that back in just a short while with interest from his investments. He should ask not what his government can do for him, but what he can do for his government. The "statement" looked like a typical Washinton Ghost spin. An honest statement would sound more like "We're sick of each other."